One of my favorite cookies as a child, whether it was helping make them, arranging them on platters, or even eating them, was bon bon cookies. They are an old fashioned cookie, dating from the days when cookies masquerading as candy were THE thing to serve. What better time to make a faux candy cookie than at Christmas? These are easy to make, easy to shape & fill, easy to bake, and just as easy to frost. After frosting, allow the glaze to dry overnight before packing them for giving, shipping, or storing. These also ship well after baking, glazing and allowing the glaze to dry completely. Make someone’s day with one of these small treasure chests! 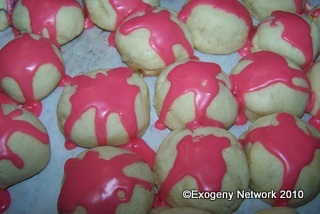 Bon bon cookies with pink icing are drying before packaging. Fillings: candied or maraschino cherries, pitted date piece, nuts, chocolate pieces, small squares of candy bars, peanut butter chips, etc. Mix butter, sugar, and vanilla. Add flour & salt; blend thoroughly. If dough is dry, add 1-2 tbsp. of cream, a few drops at a time. Heat oven to 350 degrees F. For each cookie, wrap 1 tbsp. cookie dough around filling and roll into a smooth ball. Place 1″ apart on ungreased cookie sheet and bake for 12-15 minutes or until set but not browned. Cool. Dip tops of cookies in icing. Decorate with sprinkles, if desired. Blend ingredients until smooth. Dip cookie tops in icing mix. Apply sprinkles, if desired.